This week the UC San Diego baseball team traveled to Azusa Pacific University to defend its NCAA Division II West Regional Crown. UC San Diego opened its tournament with a bang, defeating Point Loma Nazarene University 22–3 on Thursday. On Friday, the Tritons continued their tournament with a comeback victory over California Baptist University, 9–8. On Saturday they beat CBU for the second time in as many days 5–3 and will advance to the championship game on Monday. The Tritons wasted no time earning a few runs against Point Loma on Thursday as they scored twice in the bottom of the first inning to take a 2–0 lead. The Tritons’ first baseman, junior Tyler Durna, worked a one-out fullcount walk to put a runner on for redshirt junior and right fielder Zander Clarke. Clarke continued his hot streak by launching a home run deep over the left centerfield wall putting the Tritons up 2–0. Clarke was named the California Collegiate Athletic Association tournament MVP last week and picked up right where he left off with another great showing on Thursday. Clarke finished the game 3–5 with 2 home runs and 7 RBIs. The Tritons added more in the next two innings as they put up 5 in the second inning and 4 in the third inning. Clarke homered again in the bottom of the second which scored Durna and redshirt freshman and center fielder Brandon Stewart. In the bottom of the third, most of the damage came on a 2-RBI liner up the middle by redshirt freshman and designated hitter Blake Baumgartner. After the first three innings the Tritons had a commanding 11–0 lead over Point Loma. Senior starting pitcher Mitch Hickey delivered once again for the Tritons and had one of his best starts of the season. Hickey gave the Tritons six solid innings of 2-run baseball, which was more than the Tritons needed in the 22–3 win. Hickey picked up his sixth win of the season and improved to 6–3 on the year. Hickey kept batters off-balance all night as he punched out 12 batters in only six innings. Hickey struck out the side in the fourth, fifth, and sixth innings and averaged 2 strikeouts an inning for his outing. Hickey was pulled after six innings, not due to ineffectiveness, but due to the fact that all of the strikeouts had pushed his pitch count to over 110 pitches. The only offensive surge Point Loma was able to muster came in the sixth inning when it put up 2, but the Tritons answered its 2 with 2 of their own in the bottom half of the sixth. Point Loma put up one more meaningless run in the ninth but it was moot as the Tritons held on for the 22–3 victory. The Tritons could not have asked for a better start to their tournament. 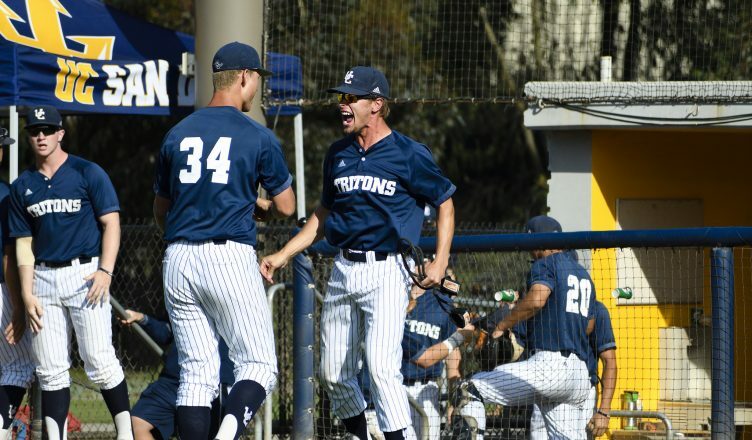 They played an almost picture-perfect baseball game in the victory over Point Loma and would look to continue this success on Friday in the next round versus CBU. On Friday UCSD continued its journey with a matchup against CBU. UCSD was down big early but came all the way back to win the game by a score of 9–8. CBU was thinking damage early as it put up 6 runs in the bottom of the first inning on 4 hits. This is reminiscent of the tournament last week, where several times the Tritons were put down early and forced to make a comeback, and they did just that. UCSD only got 1.1 innings out of its senior starting pitcher Jack Rupe Jr. Rupe was ineffective on Friday as he allowed 5 hits, 6 runs, and 2 walks in the 1.1 innings that he pitched. Luckily for Rupe and the Tritons, his teammates were able to pick him up. The bullpen duo of junior right-handed pitcher Kyle Lucke and redshirt junior right-handed pitcher Cameron Kurz finished the remaining 7.2 innings, allowing only one combined earned run. Kurz was especially nasty on Friday as he closed out the final three innings allowing only 1 hit. Of the nine outs recorded by Kurz, eight of them were by the way of the strikeout. The Tritons put up one run in the top of the third inning to chip away at the 6-run deficit on a 2-out fielding error by CBU second baseman Luke Navigato. However, the CBU Lancers erased the Tritons run with one of their own in the bottom of the sixth inning, putting the deficit back at 6 runs. Down by 6 in the top of the seventh inning, the Tritons were in desperate need of a comeback and were running out of time. The bats had not been working all night, so the Tritons adopted a more patient approach and looked to take advantage of any and all mistakes made by the Lancers. These opportunities came in the seventh and the Tritons put up 6 runs to tie the game 7–7. In the inning the Tritons only had 2 hits but were able to score 6 runs due, in part, to walks by senior second baseman Justin Beck and redshirt junior third baseman Alex Eliopulos, to sloppy play by the Lancers in the likes of a passed ball, 2 hit-by-pitches, and a fielding error. However, the Tritons’ success was short-lived as the Lancers took the lead again during the bottom half of the inning. With runners on the corners and only one out, the Tritons had another opportunity to tie the game, and they did just that. Redshirt sophomore catcher Nick Kitzmann hit a bouncing ball too short, and after the shortstop stepped on second base he had no play at first. This negated the chance of a double play and let redshirt sophomore left fielder Keenan Brigman score from third, tying the game once again at 8. After a 1–2–3 bottom of the eighth the Tritons were back up to bat in the ninth with the game still tied. With one out and nobody on base, the Tritons’ Clarke stepped up to the plate. The CCAA tournament MVP came through once again for the Tritons with an opposite-field home run deep over the right-field wall, giving the Tritons the lead of 9–8 in the ninth inning. This was Clarke’s 18th home run of the year and third of this tournament. The Tritons held on in the bottom half to win the game 9–8. With the win they moved on to game three on Saturday night in a rematch versus CBU with the winner moving on to championship Monday. For the second-straight night UCSD bested the CBU Lancers with a 5–3 and will play in Monday’s championship game to defend its NCAA Division II West Regional Championship. As the great Yogi Berra said, “It’s deja vu all over again” as the Tritons were down early once again at the hands of the Lancers. Triton junior and starting pitcher Preston Mott was slow to settle in as he allowed 3 hits and 2 runs in the bottom of the first inning, leaving the Tritons down 2–0 after one inning. After the shaky first inning Mott found his rhythm and allowed no further runs until his departure in the sixth inning. Mott finished the game with 5.1 innings pitched with 9 strikeouts and earned his eighth win of the season. The Tritons immediately answered the Lancers’ first inning run with one of their own in the top of the second inning thanks both to a pair of singles by Beck and Brigman and to a throwing error by the Lancers’ third baseman Harrison Spohn. Unlike on Friday, the Tritons did not wait several innings to come back as they put up 2 more runs in the top of the third inning to take a 3–1 lead. The damage in this inning came on 2 doubles by Durna and Eliopulos, which knocked in Durna and Stewart. After several quiet innings, the game moved into the ninth inning still at 3–1 in favor of the Tritons. Brigman led the inning off with a line drive to dead center-fielder giving the Tritons speed on the basepaths with no outs and leaving Baumgartner to step up to the plate. However, Brigman’s speed was unnecessary as Baumgartner hit moonshot high over the right-field wall, giving the Tritons some insurance runs late in the ballgame. Freshman right-handed pitcher Cameron Leonard closed out the final five out of the game and allowed one meaningless run as the Tritons were victorious 5–3. Leonard pounded the zone in his 1.2 innings of work as 16 of the 19 pitches he threw were for strikes. That strategy paid off as he earned his third save of the year in the Tritons’ victory. The win puts the Tritons into the championship game on Monday versus the Azusa Pacific University Cougars at noon as they look to become repeat Division II West Regional Champions.